Early this month, Jane Eguillos shared some photos of a tricycle driver named Rodolfo “Rudy” Pastrana who was wearing a baby carrier also tied to his trike so he could keep his son ‘safe’ while he drives around Pasig City. Eguillos grew concerned because the child was crying at the time; she learned that his milk bottle was damaged after it was run over by a car. Hearing this, another passenger offered one of her feeding bottles to the driver; Eguillos would also buy the kid another one later. Tatay Rudy understands the dangers his child faces but has no choice because he has no one to leave the boy to as his mother also goes out of the house to work as laundrywoman. “May asawa ako 3yrs kami ang kaso simula noong binilhan ko ng cellphone at nag Facebook, may nakilala siyang lalaki at doon sumama siya. 2 buwan na niya kaming iniwan,” he told Eguillos. A lot of netizens were touched by this man’s plight and his story went viral, with many praising him for trying his best to take care of his son despite the challenges he has to face. 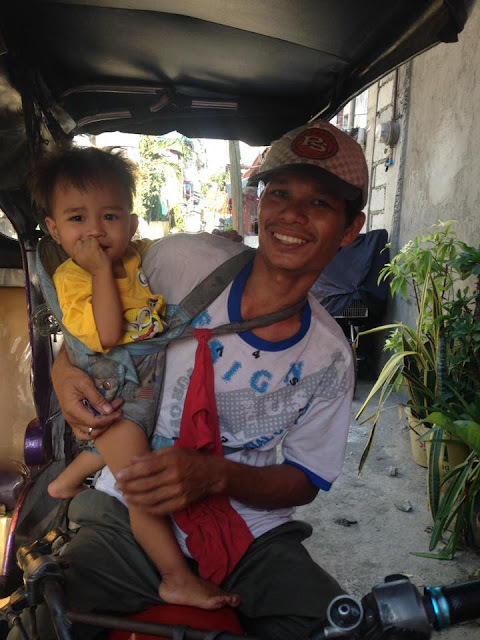 Taking pity on this hardworking and loving father, the team not only provided the family with groceries, milk, and diapers for his son but also gave him a tricycle with franchise to ensure all his earnings will go to his pocket and that he no longer has to pay a boundary to someone else.